The Effelsberg 100-m Radio Telescope is a radio telescope in the Ahr Hills (part of the Eifel) in Bad Münstereifel, Germany. For 29 years the Effelsberg Radio Telescope was the largest fully steerable radio telescope on Earth. 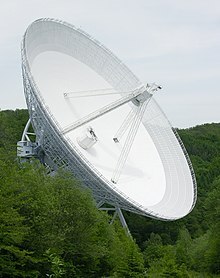 In 2000 it was surpassed by the Robert C. Byrd Green Bank Telescope in Green Bank, US which has a slightly larger elliptical 100 by 110-metre aperture. The telescope is located about 1.3 km northeast of Effelsberg, a southeastern part of the town of Bad Münstereifel. It is placed less than 300 m west of the 398 m high Hünerberg, which is already in the neighbouring Land of Rhineland-Palatinate. In the vicinity of the telescope, the boundary of the Land of North Rhine-Westphalia is the Effelsberger Bach, which runs only a few metres east of the telescope. The Effelsberger Bach is 6.5 km long, flowing from the Effelsberger Wald into the Sahrbach, which in turn flows south and into the Ahr river. A hiking path leads past the telescope; in 2004 part of this was turned into a planet trail with information panels about the Solar System with its planets. The trail ends at the 39 cm model of the Sun next to the visitor centre. The Effelsberg radio telescope is operated by the Max Planck Institute for Radio Astronomy in Bonn, the radio astronomy institute of the Max-Planck-Gesellschaft. It was constructed from 1968 to 1971 and inaugurated on 1 August 1972. A major technical difficulty in building a radio telescope of 100 m diameter was how to deal with the deformation of the mirror due to gravity when it is rotated to point in a different direction. The mirror must have a precise parabolic shape to focus the radio waves, but a conventionally-designed dish of this size would "sag" slightly when rotated so the mirror loses its parabolic shape. The Effelsberg telescope uses a novel computer-designed mirror support structure which deforms in such a way that the deformed mirror will always take a parabolic shape. The focus will move during such deformation, and the feed antenna suspended in front of the mirror is moved slightly by the computer control system as the telescope is rotated to keep it at the focus. Tests after completion of the telescope showed that the intended accuracy of the mirror surface of 1 mm had not only been met, but exceeded significantly. About 45% of the observing time is available to external astronomers. The Effelsberg 100-m telescope was involved in several surveys, including the one at 408 MHz (73 cm) by Haslam et al. Wikimedia Commons has media related to Radiotelescope Effelsberg. ^ Ridpath, Ian (2012). A Dictionary of Astronomy. OUP Oxford. p. 139. ISBN 0-19-960905-5. ^ Haslam, C. G. T.; Salter, C. J.; Stoffel, H.; Wilson, W. E., A 408 MHz all-sky continuum survey. II – The atlas of contour maps, Astronomy and Astrophysics Supplement Series, vol. 47, Jan. 1982, p. 1, 2, 4–51, 53–142. ^ "A 408 MHz all-sky continuum survey. I - Observations at southern declinations an". Adsabs.harvard.edu. Retrieved 2016-11-30. ^ "Home | Max Planck Institut für Radioastronomie". Mpifr-bonn.mpg.de. Archived from the original on 2012-02-22. Retrieved 2016-11-30. Bill Keel's "Telescopes I've seen"
This page was last edited on 16 April 2018, at 20:51 (UTC).